My hair is pretty dry at the best of times but now the outside temperature is beginning to drop and we’re cranking up the central heating in response, it’s time to start paying close attention to maintaining our moisture levels. And I’m not talking about the amount of vodka in our blood-streams. 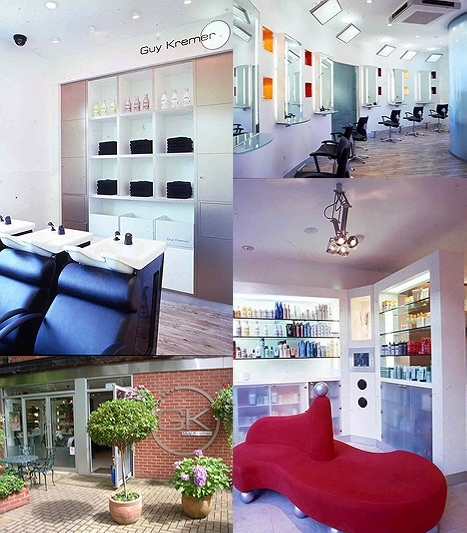 Guy Kremer‘s salon in Winchester (my nearest town – I wish that made me posh by association) is a rather lovely place. I once had the pleasure of visiting when they miraculously managed to transform my Aunt’s rather horrible NHS cancer wig into something that actually resembled natural hair. I’ve been a fan ever since. Here’s some tips from the celebrity stylist himself on how to combat dull, dry, limp and lifeless Winter hair. 1. Book an appointment for a trim to get rid of those split ends and prevent further damage to your hair. 2. Take quick remedial action by using a deeply penetrating hair repair treatment, which will deliver a dramatic improvement in condition and shine. After shampooing and rinsing hair thoroughly, blot dry with a towel and work conditioner into your hair, distributing evenly. Massage gently, using circular movements of the fingers then leave for 3-5 minutes so the nourishing ingredients can penetrate the hair shaft infusing it with moisture and nutrients. Comb through using a wide toothcomb before rinsing and styling as normal. 3. Blot dry with a towel, do not rub or you will ruffle the cuticle, which depletes shine. Smooth and nourish hair with a styling product, for straight hair using Straightening Balm for curly, Curl Cream. After drying smooth on a few drops of serum which coats each hair with a fine film of silicone that smoothes the cuticle, eliminates frizz, creates texture and adds shine. It also stops hair absorbing moisture from the atmosphere which can make your style drop. 4. Help restore the natural moisture balance in your hair by using specialist shampoos and conditioners for dry, frizzy hair. These help restore natural vitality that has been lost by the damaging UV rays. Tinted hair will be suffering from fade caused by the sun. Refresh colour by asking your hairdresser for a semi-permanent in the same shade as normal. It will add instant lustre and enrich the colour. 5. Bleached or highlighted hair will have soaked up minerals and chemicals from swimming pools and may well be showing signs of a green tinge. Use a deep cleansing shampoo to strip away deposits and restore natural lustre. 6. Natural curls or permed tresses could be suffering from damaged or lifted cuticles which, makes hair look dull and be prone to tangle. Boost curls using an energising spray which will add life. Follow by warming a few drops of serum in palms and work through outer layers of hair to give instant shine and suppleness. What are your winter hair tips? or when i’m on holiday after i’ve been in the pool/beach, i always buy a massive bottle of Pantene Conditioner and slather on a handful and really massage, miracle worker! I’m really curious about this miracle product now! Can’t wait to hear what the miracle is! I really respect the stylists that make the effort to help cancer patients with their wigs. They can make such a difference to people’s confidence and outlook. Good advice off him too. I always make an effort to extra-condition my hair this time of year; it makes such a difference! Sorry, but as someone that suffers from bleached and highlighted hair by choice, and dry hair by…nature, I gotta say half of this would do more damage to the hair than any good! I do agree that nourishing products, with say proteins etc are neccessary for the cooler months. Silicone however (which has nth really nourishing abt it) as good as it can make your hair *look* after a blow dry, it actually dries the hair even more if used very often. This coming from sm1 that has used tons of silicone bottles. I completely stopped using silicone and switched to coconut oil and saw a huge difference! Also, deep cleansing shampoo may restore colour, BUT it will also strip the hair of any moisture it still has left in it! Perhaps a deep cleansing shampoo could be used once, followed by heavy moisturising!!! Personally, I find blue/purple shampoo to be slightly gentler than deep cleansing shampoo. Hope this comment isnt taken the wrong way – being sm1 who has listened to numerous hairdressers go on abt miraculous silicone, when in fact it can be damaging, somehow hit a nerve!